SHARON, Mass. — It’s not always the perfectly drawn up play that can get you a game winning shot, sometimes a broken play works out just as well. With 19.5 seconds to go, Sharon called for a timeout after Foxboro tied the game 46-46. Senior Andrew Filipkowski took possession outside the three point line as time winded down to 10 seconds. He raced all the way around the edge, turning the corner on the baseline before dishing out to senior Matt Lowerre in the corner. A slight pump fake allowed Lowerre to drive hard at the hoop, sucking in the defense. Lowerre handed the ball off to junior Peter Banks at the free throw line and he quickly shuffled the ball along to senior David Roelke. Roelke caught the pass – which was slightly to his left – with one hand, bringing it to his right and rising up all in one motion, shooting a three over the outstretched hand of a lounging defender. Roelke’s three gave the Eagles a 49-46 win over Foxboro and put the two teams into a tie atop the Davenport Division with five league games remaining. Before Roelke sent the Eagles into hysterics, it was Foxboro riding a wave of momentum. The Warriors had only trailed once in the first half (down 2-0) and a nine point lead at one point but took just two point cushion into the halftime break. Sharon took its first lead of the second half when Tyler Smith drained the team’s first three pointer with just over a minute to play in the third to go up 32-21. Andrew Filipkowski drained another with 36 seconds to go in the third to give Sharon a 35-33 lead heading into the fourth. “We hit three’s in the second half,” Ferguson said of what was the difference between halves. “I thought we got a lot of shots in the first half, we just missed some easy ones. We were tight coming in in a big game against Foxboro. It was similar to what we did against Oliver Ames. It’s an emotional game where you don’t execute as well and finish as well. I think once we calmed ourselves down in the locker room and then started watching them go in, it became easier for us. It was all Eagles for the first half of the final period as buckets from Ricardo Ripley, Lowerre and Banks preceded a three from Roelke that gave Sharon a 44-36 lead halfway through the fourth. That’s when Foxboro flipped the switch back to on and closed the gap. Alex DuBrow drained a three but Jimmy Fitzhenry hit a free throw to keep Sharon’s lead at six. With a tick under 90 seconds to play, DuBrow then banked a deep three from straight away to make it a three point game. The Warriors missed a pair of free throws but senior Rob Lowey (seven points, 14 rebounds) came up with the offensive board and putback to get within one. Bryce Smith hit the front end of two free throws to make it a two point game and then confusion — mainly just for the officials — set in. 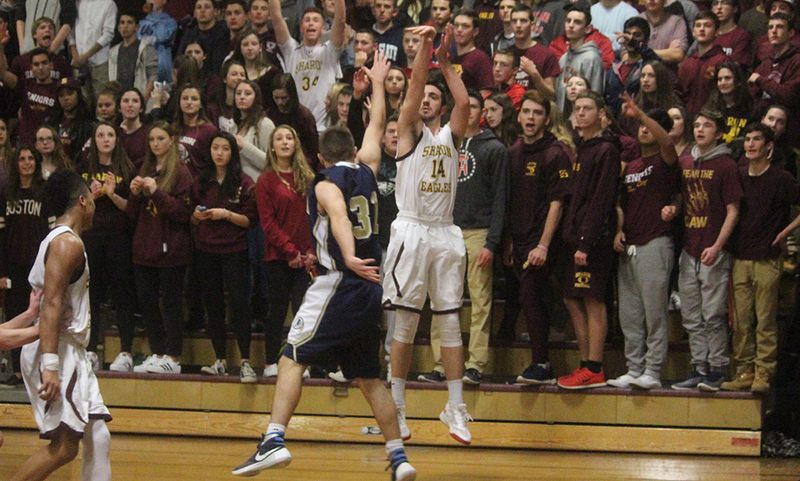 As the shot clock was winding down and just 30 seconds to play, Jason Procaccini (game-high 18 points, 11 rebounds, six steals) launched a three that hit off the backboard without touching the rim. Lowey grabbed the rebound and quickly put it up, releasing before the buzzer. The shot hit the rim but missed. Joe Morrison tipped the rebound up and clearly pulled in the rebound to keep possession for the Warriors but the whistle blew with one ref putting his hand on his head for a shot clock violation. After a lengthy discussion, the refs awarded the ball back to the Warriors but instead of a fresh clock (or no shot clock at all since there was only 25 seconds to go), they somehow decided on five seconds on the shot clock. Foxboro still made it work though as Procaccini got in the post and quickly went up with it to tie the game with just over 20 seconds to play, setting up a timeout for Ferguson and the eventual winning shot from Roelke on the ensuing possession. The Eagles had nine players register points on the scoresheet and beyond Roelke’s winning three, the most important came from Bryce Smith. When Foxboro held its nine point lead (21-12), it was Smith that rattled off seven straight points to keep the Eagles close. In just his third game back from injury, Smith injected the Eagles with some energy. First came the traditional three point play, then another bucket, followed by a steal and another layup while being fouled to pull Sharon within two just before the break. Procaccini was a big reason for the lead for Foxboro, recording 12 points and five of his steals in the first half. “It just seemed like it was one of those nights that for whatever reason, the ball just wasn’t going in the basket,” Foxboro coach Jon Gibbs said. The Warriors connected on a season-low four three pointers. “I thought we had some good looks and the ball just didn’t go in. We had some layups and shots in the paint that didn’t go in, we missed a lot of free throws but that’s basketball. You’re going to have nights like that, especially on the road. On those nights you have to rely on your defense to carry you and I thought our defense in the first half was excellent but for whatever reason we were flat in the third quarter. I really felt like in the first half we should have been able to get some separation, we played really good defense. But because we missed some easy shots we couldn’t get that separation. Roelke finished with a team-high 12 points while Smith and Banks (eight rebounds) each added 10 points. Beyond Procaccini, DuBrow had 13 points and three rebounds. “We had some sloppy ones,” Gibbs said of his team’s 21 turnovers. “Coming into the game we talked about being patient and playing simple and getting a great shot every time and I don’t think we did a great job. I think we tried to force the home run pass early in possessions and that resulted in some turnovers. There were also some times we were being a little too unselfish around the rim instead of just powering it up strong. Sharon (9-4, 8-3) moves into a tie for first place in the Davenport. There are no tiebreakers for division champs so head-to-head does not put the Eagles in first. Sharon will host Franklin in a battle of division leaders on Monday night. Foxboro (10-3, 8-3) will have a quick turnaround as they take on Bridgewater-Raynham on Sunday morning at 10:00AM at the Dunkin Donuts Center. Attleboro, 43 @ Mansfield, 61 – Final – Mansfield built a double-digit lead by halftime and never looked back. Matt Ehrlich had a team-high 14 points and added four rebounds, Sam Goldberg had 12 points, six rebounds and five assists and Max Boen (four rebounds), Tyler Boulter and Phil Vigeant each had six points for the Hornets. Jake Dunkley had a game-high 15 points for Attleboro, Lucas Boucicaut added 12 points and Kyle Murphy had eight points and 10 rebounds. Milford, 68 @ Canton, 50 – Final – Dimitry Torres netted a career-high 26 points to spark the Scarlet Hawks to a road win at Canton. 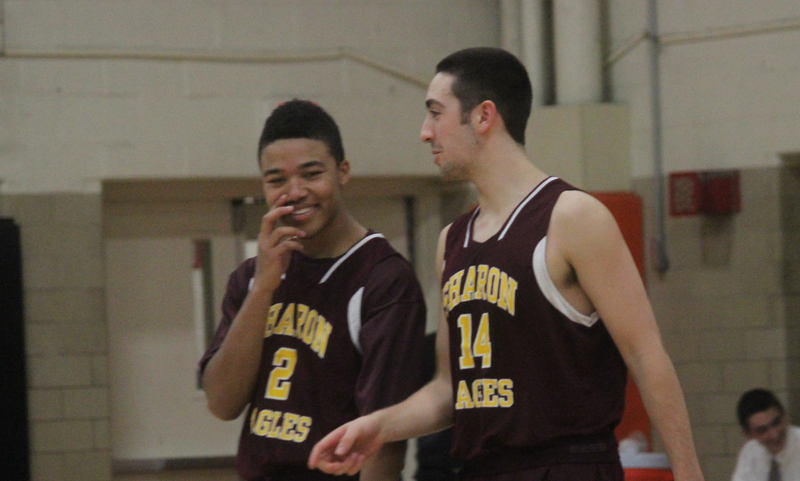 Dwight Anderson added 15 points and Josh Andonian chipped in with 10 points for Milford. Foxboro, 46 @ Sharon, 49 – Final – David Roelke hit a three as time expired to lift Sharon to a key Davenport division win. Roelke had a team-high 12 points while Peter Banks (eight rebounds) and Bryce Smith each had 10 points. Foxboro’s Jason Procaccini had a game-high 18 points and added 11 rebounds and six steals. Alex DuBrow had 13 points and Rob Lowey had seven points and 14 rebounds. North Attleboro, 57 @ Franklin, 60 – Final – Tim Prunier hit two free throws down the stretch to stretch the Panthers’ lead to three as Franklin outlasted North Attleboro. The Rocketeers trailed by nine at halftime but rallied to get a 45-44 lead heading into the final period. Prunier finished with a team-best 18 points while freshman Jay Dieterle added 13 points and sophomore Connor Peterson had 11 points. North junior Brent Doherty also had 18 points, Kyle McCarthy scored a career-high 13 points in his first start and Mario Bresko added 11 points. King Philip, 54 @ Taunton, 62 – Final – King Philip led for three quarters but Taunton was able to overcome the deficit and get the win in the final quarter. Senior Carlos Borrero scored all 11 of his points in the second half and senior Jose Mercado finished with a game-high 17 points. Tommy MacLean added 13 points. Sophomore Tom Madden had a team-high 13 points for KP, who also got 10 points from Seth Sullivan and Pharoah David each. Stoughton, 48 @ Oliver Ames, 70 – Final – Dylan Mahoney had a team-high 15 points while Tim Kelley, Shawn Cardoza and Nick Welch all added 11 points apiece in the Tigers’ big win. Canton, 47 @ Milford, 42 – Final – Kate Irwin was Milford’s top scorer with 10 points in the win. Jill Powers and Nicole Dahlgren each added nine for the Hawks. Sharon, 20 @ Foxboro, 50 – Final – Ashley Sampson had a game-high 15 points, Grace Tamulionis added 11 points and MacKenzie Anderson chipped in with six points. Franklin, 63 @ North Attleboro, 47 – Final – Franklin broke open a three-point game at the half with a 20-5 run in the third quarter. Carli Koffinke was the top scorer for the Panthers with 13, while Aubrie Kutil added a double-double with 11 points. Lauren Rudolph for Franklin and Olivia Adiletto eight. Emily Peters scored 20 points for the Rocketeers in a losing effort. Taunton, 41 @ King Philip, 50 – Final – KP outscored the Tigers 15-5 in the fourth quarter to get the win. Rylie Dalzell led the Warriors with 13 points. KP also got 10 points each from Maddie Purdue and Christina Hathaway. Taunton sophomore Hannah Moniz had a game-high 14 points and freshman Lily Patneaude chipped in with nine points for the Tigers. Mansfield, 38 @ Attleboro, 48 – Final – The Bombardiers finished the game with a 9-0 run in the final 4:27 to clinch the win. Sam Pierce led Attleboro with 14 points and 11 rebounds. Sarah Deyo had 13 points and 12 boards and Emily Houle had nine points for the Bombardiers. Mansfield was led by Jen Peel with 11 points and five assists. Meg Hill added nine points, 11 rebounds, and eight blocks. Oliver Ames, 51 @ Stoughton, 34 – Final – Francesca Calabraro led all scorers with a season-high 23 points and added eight steals while classmate Niyera Mitchell had a double-double with 11 points and 10 rebounds. The Bulldogs have a good amount of talent with experience returning this season and have added some key young pieces and head coach Ryan Gordy is hoping that combination will be a recipe for success this season. Senior captains Rishi Jambunathan, Woanyen Mahn and Ben O’Neill all got plenty of experience last year and will be relied upon in getting the younger players involved. Griffin Jerrier, who was a strong rebounder last year, is also back and will help the Bulldogs in the paint. When it comes to talent coming back, Foxboro is near the top of the list with the players they have returning this season. Hockomock League All Stars Alex DuBrow and Robby Lowey are both back for their senior seasons and will look to lead the Warriors to another deep postseason run. Along with DuBrow and Lowey, Foxboro has junior Mark Clagg (third year of varsity), Andrew Block and Jonathan Carnino all back this season. Sophomore Joe Morrison was brought up at the end of last year and the Warriors got transfer Jason Procaccini from Nobles and he could emerge as one of the Foxboro’s top scoring options. Head coach Jon Gibbs will be relying on experience and depth to try take the next step this year. After just two wins in head coach Paul Seaver’s first year, the Scarlet Hawks are looking to take a big step forward in the 2015-2016 season. With nearly everyone back, Milford is in prime position to pick up more victories this season. Dwight Anderson, a Hockomock League honorable mention last year, is back for his senior season, junior sharpshooter Nate Davila is back, junior Zack Tamagni will be back running the point and senior Dimitry Torres is a player that can make an impact at both ends of the court. Sophomore Kayden Kelley saw some time in the second half of the season last year and should provide good length and size in the post. After reaching the D2 South Final last season, the Tigers will have a to overcome a lot to try and get back there this season. All five starters (Carney, Handy, Kyne, Flynn, Welch) from last year’s team graduated as well as a key role player off the bench (Kelley) and another junior Franklin Holgate transferred to Nobles. But the goal hasn’t changed for Oliver Ames as the Tigers will be making a push for the postseason again this year. Senior Tim Kelley will be one of the Tigers’ go-to options on the offensive end of the court and junior Carter Evin will provide some size in the post to give OA options on offense and defense. Connor Moroney will also be a source of scoring while Shawn Cardoza is another post player with some good experience. Similar to Foxboro, Sharon is near the top of the list when it comes to returning players back this year. First year head coach Andrew Ferguson has eight returning varsity players at his disposal as the Eagles will look to not only make the playoffs, but try to get further than they did this past season. Seniors Matt Lowerre, Tyler Smith, Bryce Smith, Mitchell Sirota, Andrew Filipkowski, David Roelke, and Michael Zola are all back for another year while juniors Ricardo Ripley and Peter Banks both saw time last year. Ferguson will be relying on that depth to try and challenge Foxboro in the Davenport title race. Although the Eagles don’t have a ton of size, they make up for it in athleticism. There are a lot of questions heading into the season for Stoughton but at the same time, there is a lot of optimism among the Black Knights. Brandon Teixeira is back for his third year on varsity and is among the best shooters in the league. He will be relied on to captain the team on both ends of the court while junior Ryan Sullivan – who saw minutes last season – should see a bigger role in 2015-2016. Beyond those two, head coach John Gallivan will be looking for others to step up and emerge as options on offense and as consistent players on defense. Sophomore Cam Andrews could be one of those players after seeing some minutes during his freshman year and junior Cam Gomes could provide some size for the Black Knights. Click here for the 2015 HockomockSports.com Football Awards. SHARON, Mass. – Coming into Saturday afternoon’s regular season finale, the conversation between fans from Canton and Sharon centered on seedings, rankings, and coefficients. The uncertainty of the playoff system loomed over the proceedings, even overwhelming the fact that a win would give the Bulldogs their first league title since 1990. Canton stormed out of the gates and led by two scores in the first half, but the Eagles were intent on spoiling the moment and rattled off 30 straight points, while intercepting four passes and allowing only one Bulldogs first down in the second half of a 30-14 victory. Sharon coach Dave Morse insisted it was the best half of football that his team had played all season and he believed that it was enough to get the Eagles into the tournament. Canton knew that it needed a win to share the Davenport crown with Foxboro, which had won on Friday night, and the Bulldogs were fired up at the start. An interception by Jude Alpert near the end of the first quarter gave Canton possession at the Sharon 37. Eight plays later, Jake Ragusa (15 carries, 83 yards) punched it in from five yards out and Thomas Monagle added the kick to make it 7-0. On Sharon’s next possession, the Bulldogs forced a three and out. Woanyen Mahn burst through the line and blocked the punt, which was recovered by Kymauny Roland and returned to the Sharon 32. Two plays later, Dennis Ross (3-11, 71 yards) looked for Michael Harris at the front corner of the end zone. Harris out-jumped two defenders to haul in the pass and make it 14-0. Sharon needed a response and got it on its next drive. Juvan Elisma had two carries to get it to midfield followed by a Rob Bayha pass to Joey Dowler down to the Canton 33. 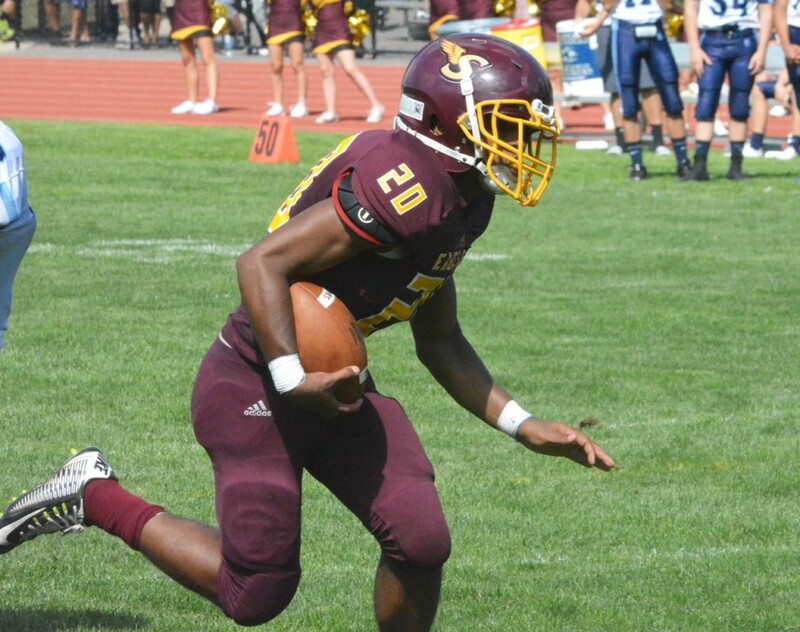 Elisma (15 carries, 81 yards) did the rest, bursting through the line and sprinting to the far sideline for a 33-yard touchdown that cut the lead in half and gave the Eagles momentum heading into the break. Canton got the ball first and was forced to punt. On its possession, Sharon moved the ball to the Bulldogs 10, with the help of a horse collar and a late hit penalty, but was forced to settle for a 27-yard Josh Rotman field goal that made it 14-10. Sensing that the Eagles had the upper hand, Morse called for an onside kick. The Eagles were quickest to the loose ball and recovered at their own 47. Canton’s defense held and forced a punt, but the energy was clearly on the home sideline in the third quarter. Sharon stopped Ragusa for two short gains and then Bryce Smith intercepted Ross’ pass to give the Eagles ball at the Canton 11. Three plays later and Matt Cancian pushed it across from seven yards out to give Sharon its first lead at 17-14. After another Canton punt, Bayha (7-17, 112) hit Tyler Smith for a 26-yard completion and the Eagles offense was in business again. Following a pass interference call against Canton, Cancian got the corner and went 15 yards for his second touchdown of the half. With five minutes remaining in the game, Bryce Smith picked off Ross for the second time in the game and would have returned it for a score only to be denied by an illegal block call. Cancian nearly had his third touchdown only to have the ball pop out at the one, which Canton recovered for a touchback. Rather than be dismayed by the turnover, the Sharon senior captain immediately got the ball back for his team when he picked off Ross’ pass on Canton’s first play. Bayha made sure that the turnover counted when he found Bryce Smith down the sideline for a 30-yard touchdown with just 2:40 on the clock. Not to be outdone by his brother, Tyler Smith picked off the final pass to seal the Eagles victory and give Sharon a chance to look ahead to a possible playoff opponent. Bohane was left deflated, as the Bulldogs were left without the league title and possibly left out of the playoffs on the final day for the second straight season. Playoff brackets will be released by the MIAA on Sunday. Second Quarter: (C) Jake Ragusa 5 yard rush, Thomas Monagle XP; (C) Dennis Ross 31 yard pass to Michael Harris, T. Monagle XP; (S) Javon Elisma 33 yard rush, Josh Rotman XP. Third Quarter: (S) J. Rotman 27 yard field goal; Matt Cancian 7 yard rush, J. Rotman XP. Fourth Quarter: (S) M. Cancian 15 yard rush, XP missed; Rob Bayha 30 yard pass to Bryce Smith, Rotman XP. 1st Quarter: (S) Christian Hill 44 yard rush, XP no good. 2nd Quarter: (M) Blake Hill 1 yard rush, Sean Lehane XP; (S) Ryan Sullivan 2 yard rush, 2pt fail; (S) R. Sullivan 2 yard rush, 2pt fail; (S) Izon Swain-Price 30 yard rush, 2pt fail. 3rd Quarter: (S) Guy Eddy 5 yard rush, XP no good; (M) Zach Lanzetta 4 yard pass to Shapel Feaster. 4th Quarter: (M) Z. Lanzetta 7 yard pass to Jack Cappelletti, Blake Hill 2pt rush; (S) Jake Gibb 16 yard pass to Steven Elice, R. Sullivan 2pt rush. Foxboro, 6 @ Ipswich, 1 – Final – Senior Devante Teixeira and junior Anthony Barreira each scored a pair of goals while sophomore Joe Morrison and junior Colin Spinney each scored once in the Warriors’ win. Sharon, 1 @ Oliver Ames, 1 – Final – Keegan Nutt scored for the Tigers and Jake Goloboy equalized for the Eagles. Taunton 0 vs. Coyle & Cassidy, 0 – Final – Coyle won the City Championship 3-1 on penalties, but it counts as a tie on the season record. Canton, 1 @ Dover-Sherborn, 0 – Final – Andrea McNeil scored the lone goal of the game six minutes into the game for the Bulldogs. Taylor Carrington picked up the shutout in net while defenders Emily Rizzitano, Colleen Phelan, Sarah Wilkinson and Julia Ezepek all played well for the Bulldogs. SHARON, Mass. – Sharon’s offense moved the ball each of their first three drives but a turnover on downs and a pair of turnovers halted the momentum each team. But the Eagles’ defense stood tall and got that momentum back. Sandwich got the ball back via an interception shortly after taking a 7-0 lead Facing a 4th and 1 situation, the Blue Knights elected to go for it but quarterback Tyler Cairns lost the ball in the push forward and Sharon senior Joey Dowler scooped up the loose ball and returned it 31 yards for a touchdown to tie the game. Sharon was in control from there on out and pick up its first win of the season, 20-14, over Sandwich. Sandwich took the lead on its third drive of the game after taking over at Sharon’s 11 yard following their first interception of the game. The Blue Knights used two plays to punch it in to go up 7-0 less than two minutes into the second quarter. Dowler’s fumble return tied the game and kept spirits high for the Eagles. Sharon allowed only 17 yards on Sandwich’s ensuing drive and forced a punt. The offense wasted little time to move up the field as Juvan Elisma took the first play 44 yards up the right sideline and then quarterback Rob Bayha hit Bryce Smith for a 23 yard completion. Back to back hand offs to Elisma result in the Eagles’ first lead of the game as he punched it in from six yards out to make it 14-7. Sandwich’s offense came back out shortly before the halftime break looking to try and level things but Sharon’s defense was stout and the Eagles took a 14-7 lead into halftime. Sharon started the second half with the ball and used 10 plays to go 65 yards to extend their lead, helped along by a couple of Sandwich penalties. After gaining just four yards on the first three downs, Sharon punted but punter Craig Titus was practically tackled after his kick and the Blue Knights were flagged for roughing the punter. A 15-yard completion from Bayha to Bryce Smith helped move the ball up field. Facing 4th and 8 at the Sandwich 29, the Eagles were able to use a hard count to draw the Blue Knights offside. On 4th and 3, Bayha hooked up with Titus for a 5 yard completion and a first down. Elisma then took the next two plays, the first for 14 yards and the second for a 5 yard touchdown to make it 20-14. Sandwich’s offense couldn’t get anything going on their ensuing drive while Sharon tried to chew up some clock on their next drive but had to punt it back to the Blue Knights. Both teams traded punts one more time as clock continued to tick away in the fourth quarter. The Blue Knights once again fumbled away possession and it was Sharon’s Tyler Smith that pounced on the loose ball. Sharon was able to get a first down but then had to punt three plays later. Facing a 3rd and six just over halfway through the final quarter, Sandwich was able to pull within a touchdown. A broken play allowed Cairns to evade a pair of Sharon defenders and then launch a pass to Jake Carter. Carter found himself open after the Eagles’ defender tripped up and he went all the way for a 66 yard touchdown. Sandwich tried an onside kick with 5:33 left but Sharon’s Mitchell Liberman fell onto the ball after it was kicked directly at him. Sharon moved all the way into the red zone and on 4th and 2 tried to convert but Elisma had the ball knocked out as he tried to push for the first down. The Blue Knights were able to into Sharon’s half to the 41 but constant pressure from the Eagles front line forced Cairns into numerous situations where he either was sacked or had to throw it away (twice flagged for intentional grounding). Bryce Smith had a big pass break up while Peter Banks had a sack on the second to last play. Sharon (1-1) will open its Davenport Division schedule on Friday night when they take a trip to Ahern Middle School to take on Foxboro (2-0). Key/Returning Players: Jake Ragusa, Sr., HB/LB; Mac Brown, Sr., OL/DL; Joe Bires, Sr., FB/LB; Nick MacGregor, Sr., OL/DL; Kenny Dulcio, Sr., OL/DL; Michael Harris, Sr., SE/DB; Woanyen Mahn, Sr., HB/DB; Mike McMahon, Sr., HB/FS; Dennis Ross, Jr., QB/LB. Outlook: The Bulldogs graduated a handful of big names this past Spring but Canton has a lot of talent coming back in key positions. Anchored by a handful of returning starters, including some who will start for the third straight year, Canton could be a tough opponent every single week. Offensively, junior Dennis Ross will take over under center after Brian Hagan graduated. There are some similarities between Ross and Hagan (21 total TDs in 2014) so the transition will be a bit easier than others experience. Ross has some speed with his legs and has good throwing strength. One target Ross will look for is Michael Harris, who is a big threat option and will get a lot of looks this season. The offensive line is strong and there is a good amount of experience. On defense, head coach Dave Bohane has a solid amount of experienced talent that will be key this season. Senior Jake Ragusa is back and has been one of the Bulldogs leading tacklers in both his sophomore and junior years. Joe Bires’ athleticism is key but his football IQ is something that will help the Bulldogs. Nick MacGregor will be an anchor on the defensive line while Bohane had high praise for Mike McMahon, who will be the defensive quarterback from his safety position. Key/Returning Players: Ronnie Martin, Sr., RB/LB; Connor Downs, Sr., RB/LB; Trevor Fishman, Sr., OT/DE; James Blake, Jr., OT/DE; Austin Ryan, Sr., WR/CB; Connor McNamara, Sr., WR/CB; Pat McCarthy, Sr., P/WR/SS. 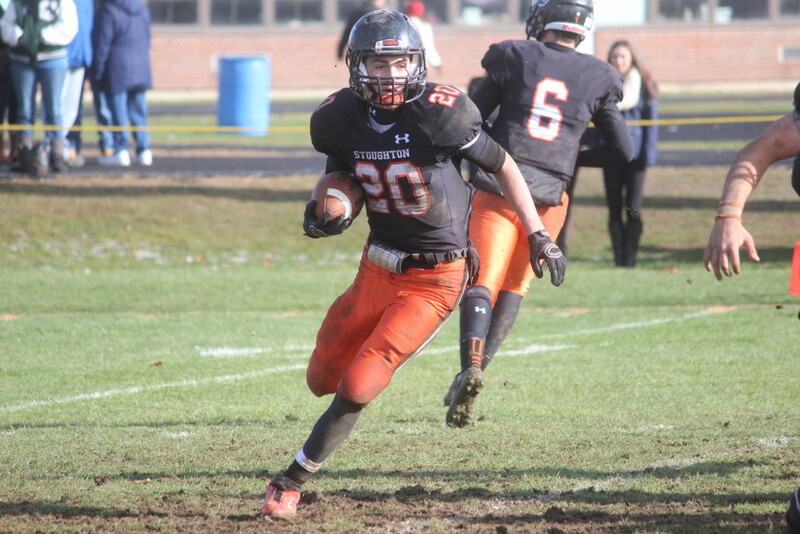 Outlook: While the spotlight is on Stoughton as the favorite of the Davenport, Foxboro has a strong core of players and should be right in the thick of things. There are some big shoes to fill left by the Class of 2015 but to no one’s surprise, Jack Martinelli looks to have his team primed for another playoff push. Junior Mark Clagg looks to be the one that will gets the reps at quarterback this season. Clagg already has a career touchdown pass under his belt when he tossed one against Walpole last year. Despite minimal varsity experience, Clagg will have a good amount of weapons to work with. Hockomock League All Star Ronnie Martin is back and should get the majority of the carries this year. Austin Ryan had a great summer in passing league and could carry that momentum into the season. With a couple of key pieces back on the line, Foxboro’s offense could be among the best in the league. Defensively, there will be some holes that the Warriors need to plug. Connor Downs will be one of the top linebackers this season while Pat McCarthy, Austin Ryan and Connor McNamara will all see time in the secondary. The key could be getting a push up front for the Warriors. Key/Returning Players: Jack Desantis, Sr., RB/DB; Leo Moronta, Sr., TE/DE; Ryan Nesta, Sr., WR/LB; Zach Lanzetta, Sr., QB; John Niro, Sr., OL/DL; Blake Hill, Jr., WR/RB/LB; Ryan Gray, Jr., OL/DL; Asong Aminmentse, Jr., RB/DB; Riley Burns, Jr., OL/DL; Harrison Bliss, Jr., OL/LB; Tony Mobilia, Jr., WR. Outlook: Milford was one of the biggest surprises in all of Division 3 last year with the run they made. With the talent they had, it’s no surprise. Although the Scarlet Hawks graduated a good amount of contributors from 2014, expect Milford to give opponents a tough time all season. One big positive for Joe Todd and Milford will be having Zach Lanzetta under center. Now a senior, Lanzetta has been getting some reps since his sophomore year. After sharing QB duties over the past two years, it looks like Lanzetta will be full time this year. Jack Desantis will get a good amount of carries out of the backfield while Blake Hill, Leo Moronta and Tony Mobilia are all receiving threats that have experience. There is a good amount of experience returning on defense for the Scarlet Hawks. Desantis and Aminmentse will patrol the secondary, while Ryan Nesta, Harrison Bliss and Blake Hill will form one of the more formidable linebacking corps in the Davenport. On the line, Ryan Gray and Riley Burns are two players with experience. Expect Milford to sneak up on some teams this season. Key/Returning Players: Connor Moroney, Sr., FB/LB; Andrew Callachan, Sr., RB/LB; Shawn Cardoza, Sr., TE/DE; Chris Hanegan, Sr., LB; Charlie Ryan, Sr., QB; Pat Mills, Sr., OL/DL; Kevin Geary, Sr., OL/DL. Outlook: There is a lot that changes with a new coach but the Tigers have more than just a new face to deal with. With graduation and a couple of transfers, Oliver Ames has a lot gaps to fill this season. Luckily, new coach Mike Holland has been in the program for years which makes the transition smoother. Charlie Ryan is back for his second year under center and his first full season as starter. Ryan tossed for nine touchdowns last season, which is second among quarterbacks returning this year. The biggest question will be finding new targets to catch those passes. Andrew Callachan has moved into the backfield this season and should get a good amount of carries. Connor Moroney will be an option on offense as will Shawn Cardoza but the Tigers will need some other faces to step up on offense. On defense, Moroney could be one of the biggest surprises at linebacker while Shawn Cardoza could be one of the best lineman on defense this season. Kevin Geary has seen varsity time and could be poised for a breakout senior season. After giving up over 23 points on average last season, the Tigers will look to get back to 2013 form, where they gave up less than 10 points a game. Key/Returning Players: Nate Hirsh, Jr., OT; Joey Dowler, Sr., TE; Josh Rotman, Jr., WR/CB; Kenny Marrero, Sr., OG; Bryce Smith, Sr., WR/CB; Tyler Smith, Sr., RB/WR/CB; Matt Cancian, Sr., RB/LB; Carlos Grullon, Sr., RB; Juvan Elisma, Jr., RB; Xavier Hackett, Jr., Safety; Keson John, Sr., WR; Ian Longol-Leonard, Jr., OT/DT; Peter Banks, Jr., OC. Outlook: The Eagles were forced to change things up last season and although the offense struggled for consistency at time, the defense was a big bright spot. Sharon was one of the top defenses in the league last year with just a hair over 20 PPG allowed. The good news for Sharon this year is the amount of players they have back at the skill positions. When the quarterback is settled on, expect players like Matt Cancian, Carlos Grullon, Juvan Elisma and Tyler Smith to all get looks coming out of the backfield. With Josh Rotman and Bryce Smith — two players that saw a lot of varsity time last season — back in the fold, Sharon will have plenty of options on offense. The key will be establishing a consistent offensive line. Defensively, the Eagles will have a strong secondary and linebackers. With both Tyler and Bryce Smith, Josh Rotman and Xavier Hackett back, the secondary has plenty of experience. Kevin Jones also has a good amount of varsity experience and will be paired with Matt Cancian at linebacker. John Dentino and Ian Langol-Leonard will be two players counted on to bolster up the Eagles defensive line. With the talent that Sharon has back, a playoff appearance might be in the picture. Key/Returning Players: Jake Gibb, Sr., QB; Guy Eddy, Sr., RB/LB; Jordan Taylor, Sr., RB; Ryan Sullivan, Jr., RB/DB; Xzavian Marrero, Sr., RB/DB; Izon Swain-Price, Jr., SE/DB; Nick Hardy, Jr., RB/DB; Steven Elice, Sr., SE/DB; Jack Connolly, Jr., TE; Matt Medina, Sr., OL/DL; Matt Soto, Sr., OL/DL; Antoyne Sellman, Sr., DB; Donny Foley, Sr., LB; Devlin Carroll, Sr., LB. Outlook: If you want to know what the Stoughton football team values, look no further than the roster they hand out at games. The Black Knights are the lone team to put defense positions first. It may be reading into it a little bit, but Stoughton has been become one of the defensive power houses in the entire state. Obviously last year was a great year for Stoughton but expect the Black Knights to reload for 2015. With their athleticism, speed and strength, there is a lot of reasons to expect another hard-nosed defense. Linebackers Guy Eddy, Donnie Foley and Devlin Carroll are all experienced players with speed and leadership qualities. IN the secondary, Ryan Sullivan, Steven Elice, Antoyne Selman and Izon Swain-Price are all individuals capable of making a big play. Stoughton will be looking to get a push on the line similar to what they had last year. Similar to the defense, Stoughton’s offense will first need to establish a solid offensive line. With Greg Burke in charge of developing the line, expect Stoughton to produce another strong one. That will be key as the Black Knights will have Jake Gibb back for his third year at quarterback and could be one of the top players in the league. Ryan Sullivan and Xzavian Marrero will be dangerous coming out of the backfield while Christian Hill, Nick Hardy, Guy Eddy and Jordan Taylor could see time carrying the ball. Steven Elice and Jack Connolly could emerge as go-to guys for Gibbs this year. Players are listed in alphabetical order. If there was one word to describe Cherefant, it would be fast. Easily one of the quickest players in the league, Cherefant gives the Tigers a threat not only on offense but on special teams. As a kick and punt returner, he can be very dangerous when he’s in open space. His legs allow him to find space and make the most of opportunities. Although his speed makes him hard to cover as a receiver, it also makes it tough if he comes in motion and takes the ball on a handoff and can get around the edge. One of our favorite plays that Cherefant made last year came against Durfee and it was handoff while Cherefant was lined up out wide. As the ball carrier broke through, Cherefant sprinted up field and made a key block to allow the ball carrier another 25 yards. When it comes to big plays, Cherefant could be making the most in 2015. Stoughton senior Jake Gibb is the only repeat from last year’s Watch List and it’s for good reason. Gibb is by far the most experienced quarterback in the league this season, entering his third year as a starter. Gibb guided the Black Knights to a perfect 5-0 division record last season, tossed a league-best 16 touchdowns throughout the entire season and used his legs to find the end zone two more times in 2014. Although top target Brandon Swain-Price graduated, Gibb has junior Ryan Sullivan (five receiving touchdowns) back again this year after a superb sophomore year and players like Xzavian Marrero, Guy Eddie, Donnie Foley and Jack Connelly could all develop into serious threats for Gibb and the Black Knights. The key will be if the Black Knights can fill holes in the offensive line. The 2014 HockomockSports.com Underclassman of the Year is back for his junior year and if it’s anything like his sophomore season, the Hornets are in good shape. Lynch had a breakout year last season, rushing for over 800 yards and finding the end zone eight times while hauling in 11 passes for 136 yards and a score. Lynch showed off last season how elusive he could be and also boasted a great burst of speed that seemed to catch defenses off guard time and time again. The Hornets have just four senior linemen on their roster so it might take a little time to get going but Lynch should be a threat, not only for this year, but for the next two seasons. There are only two 2014 Hockomock League All Stars from the Davenport that are returning this year and Ronnie Martin is one of them. Martin was part of a two-headed rushing attack with Keeyon Neal but will certainly carry a heavier load this season. Despite Neal getting the majority of the carries (and 15 rushing TDs), Martin was able to find the end zone seven times carrying the ball and once catching the ball. Martin possesses the ability to make the first defender miss and is willing to put his head down and go at the defense but one thing that he is very good at is moving from side to side to find some space and get up field. Martin could be a darkhorse for the top player in the league this year. There was a lot of turnover at quarterback last year with over half of the league graduating their starter. Attleboro has the benefit of bringing back McGovern for his junior year, just a year removed from throwing 10 touchdown passes, which was third best in the Hockomock League. McGovern has shown at times just how good he can be throwing the ball with his quick release in Mike Strachan’s offense. With Kyle Murphy anchoring the offensive line, McGovern should have some time in the pocket to make the right decision when needed. 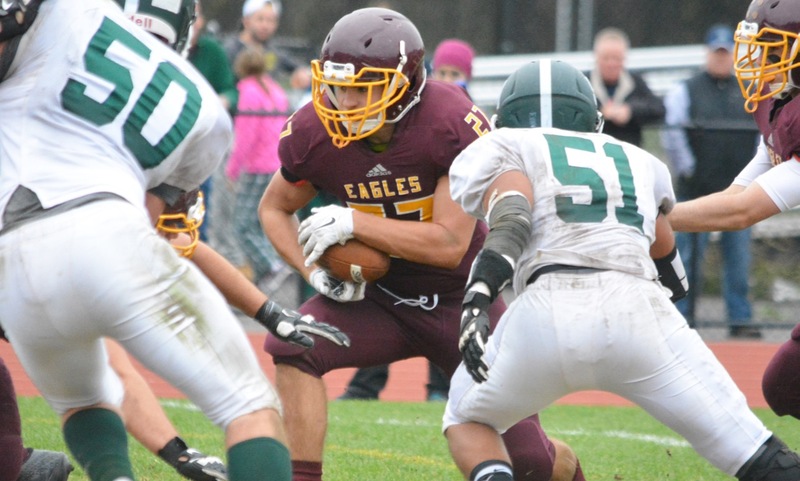 The Bombardiers lost Brenden Massey (nine receiving TDs) to graduation but with Brendan Nunes and Alex Silva (each had two TD receptions in 2014) back, McGovern will have some familiar faces to develop more chemistry with. I think it’s safe to say that the Rocketeers have the most proven depth returning when it comes to running backs. As sophomores, Mylod and Rajotte combined for 13 touchdowns last season and Mylod’s nine rushing scores was the highest total by a non-senior. The combination of the two makes the Rocketeers offense one tough to stop. With different options in the backfield, it’s tough to know what North Attleboro will run. Both Mylod and Rajotte showed last year just how quick they can be. Mylod showed last year the ability to go in motion, take the handoff and get around the edge almost at will. And when it comes to open field, good luck trying to catch Rajotte. You can’t rely strictly on 7v7 passing league, but if it’s any indication of what’s to come, Austin Ryan is set for a gigantic 2015 season. At the Under Armour South Regional, Ryan had arguably the best day of all the receivers among the dozens and dozens of teams there. Junior QB Mark Clagg and Ryan showed off tremendous chemistry on that date that would be trouble for any opposing defense. Ryan isn’t the tallest in the league but his shiftiness and quickness make it very hard for anyone to cover him one on one. With a solid running game, and other threats emerging in the passing game, Ryan could be one of the best receivers in the league this year. One player who really showed some promise in the second half of the season last year was Oliver Ames QB Charlie Ryan. Once the ball was in his hands, it seemed like plays were made. From the second Ryan took over under center, he looked comfortable controlling the offense. The biggest questions for the Ryan and the Tigers this season will be replacing the weapons (Franklin Holgate, Sam Kelly, Doug MacDonald) that he had last year. Ryan’s footwork is also one of the things that make his game complete. With pressure, Ryan is able to use his feet to move in the pocket or can throw on the run as well to make a play. If there isn’t anything down field or the Tigers choose to run the option, Ryan has the ability to take off and run with it and beat a defense. Although there are pieces to fill, Ryan could be help guide the Tigers to another playoff berth. Both Bryce and Tyler Smith look to be big factors in the Eagles’ offense this year. Both of them have been making plays for Dave Morse since their sophomore year and will likely continue doing so this year. Bryce has been one of the Eagles’ top receiving threats over the past couple of years and with his athleticism, expect more of the same. Bryce’s route-running skills are among the best in the league and he has the ability to beat a corner if he’s left in a one on one situation. In the past, Bryce has also shown that he can go up and get the ball with his athleticism. On the other hand, Tyler has been one of the top producers coming out of Sharon’s backfield. When he gets the ball, Tyler is tough to stop on first try and has the ability to get around the edge or cut back up field when he comes in motion or takes a sweep. The two combined for seven touchdowns last year and very well could top that in 2015. It’s not often a player starts a career like Ryan Sullivan did last season with a three touchdown performance in his first game against North Attleboro. And the good news for the Black Knights is that it didn’t stop there. He finished with five receiving touchdowns, three rushing touchdowns and a punt return for a score. With quarterback Jake Gibb back, expect Sullivan to get even more looks as the chemistry continues to increase. And with carries to be had due to graduation, Sullivan will most likely get more touches out of the backfield. During his sophomore year, Sullivan showed off how quick he can be coming off the edge and also showed the ability to find the hole and find his way through it. Once the Black Knights’ offensive line gets in gear, Sullivan will be very dangerous.